Washington: Israel’s April election has at times felt like it might be Benjamin Netanyahu’s last. But even as he tries to fend off a string of corruption accusations, the prime minister cannot be counted out. He has survived 13 years in office, and he now has a Trump card up his sleeve. Even before the Israeli prime minister’s arrival, Trump bestowed an electoral gift, declaring US readiness to endorse Israeli sovereignty over the Golan Heights, a plateau Israel captured from Syria and occupied more than half a century ago. Accepting the annexation of conquered land is unprecedented in modern US history and runs counter to the founding principles of the United Nations. The US secretary of state, Mike Pompeo, was on hand in occupied Jerusalem to celebrate with Netanyahu when Trump tweeted out his decision on Thursday. The shared theological language, has helped bond an alliance with American evangelicals which is key to Netanyahu’s clout in US politics. Pompeo underlined the symbolism of that coalition by visiting the Western Wall in occupied Jerusalem with Netanyahu, becoming the first senior US official to visit the contested Old City accompanied by an Israeli counterpart. Coming after the decision to recognise occupied Jerusalem as Israel’s capital and to move the US embassy there, Thursday’s Golan declaration served to boost the central message of Netanyahu’s campaign: that only “King Bibi” could get an American leader to implement hawkish policies on Syria, Iran and the Palestinians that previous US presidents dismissed as catastrophic for Middle East peace. 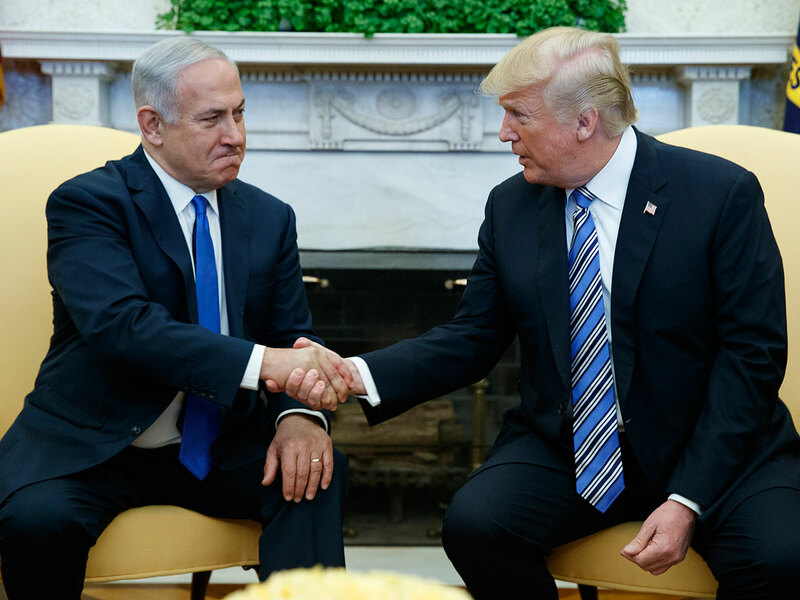 On Thursday, Trump denied he was providing Netanyahu a formal presidential endorsement, going as far as to claim unfamiliarity with the April 9 elections. Wittes pointed out that when Trump was under fire for allowing anti-Semitism to fester after 11 American Jews were killed by an extremist in a Pittsburgh synagogue, Netanyahu went to his defence.